A year after his Cinderella story at the 1992 U.S. Open 9-Ball Championship ended with an 11-1 victory over Johnny Archer in the final, Tommy Kennedy hoped to recapture that magic as he made another run late into the prestigious event. Locked in a hill-hill set with Filipino Rudolfo Luat, Kennedy appeared to be an open table away from advancing to the tournament's final day. But position play on the 6 went awry, leaving him nearly frozen to the object ball without an angle to clear the match's final three balls. Kennedy played safe, leaving Luat in the position shown here. With a tricky angle toward the 6 that required him to cue over the 9, Luat surveyed his options for a full minute before taking his stance behind the cue ball. 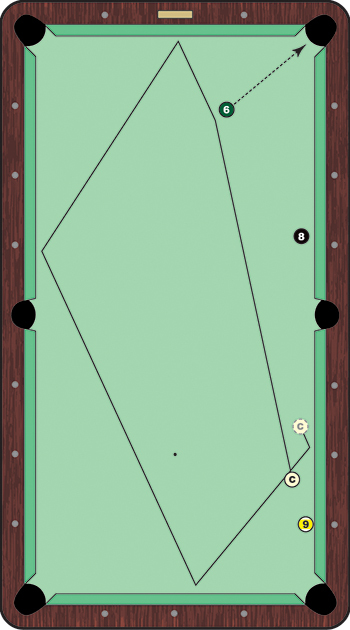 Instead of playing safe, Lust cut the 6 ball at what looked like an impossibly thin angle for the top right corner pocket. As the 6 headed straight for the back of the pocket, the cue ball traveled four rails for perfect position on the 8 ball in that same corner. Luat easily erased the last two balls for the 11-10 win. While the shot worked out as planned for Luat, it's worth taking a second look to see just what the Filipino cuesmith had in mind. Considering the lack of safe places on the table, he might have had a contingency plan if the 6 ball didn't fall. As the cue ball rolled to a stop between the 8 and 9, it most likely would have hid from the 6 had Luat missed the pocket. This two-way shot is a perfect example of the creativity and execution that has made Luat one of the most feared Filipino players in recent history.